The MSA Cairns Shell Release System (SRS), offered in our most popular fire helmets, protects from impact and heat—even when your helmet is dislodged from your head. With the SRS, if your helmet comes off because you fell through a floor or roof, the impact cap separates from the helmet shell, but remains on your head, leaving your head better protected from additional impact, projectiles and heat. Without SRS, all you’ve got is a flash hood. North America's first (and still the best) NFPA 1971 and ANSI/ISEA Z87.1 impact-rated, integral visor. The Defender Visor was designed with firefighters in mind. The entire visor stows when not in use (so it can’t be lost), and can be deployed the instant it’s needed – even with a gloved hand. Replacement of the lens does not require special tools or disassembly of the helmet. All of these benefits make the Defender Visor the best-selling firefighting eye protection in the market. In a survey of firefighters across the nation1 , the majority listed MSA Cairns brand as "best in class. "1 When you consider the combined effectiveness of our SRS, crumple-zone front holder, impact cap, and suspension—our fire helmets offer the most complete package on the market. 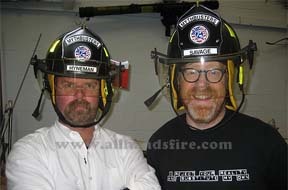 We know, as do firefighters, that MSA Cairns Helmets are the most durable products on the market. We back up that claim with a 10-year lifetime warranty that the product will be be free from defects in materials and/or faulty workmanship2 . When you factor in the quality, ease of maintenance and unique safety features found ONLY in MSA Cairns Helmets, it's easy to see why firefighters are loyal to the MSA Cairns brand. For the complete diagram of parts and replacement parts for each MSA Helmet, click here.